A professor of genetics and neurology at Harvard Medical School in Boston, Yankner’s initial work uncovered age-specific changes in activity of certain genes associated with learning and memory . A computational analysis suggested that a master regulator protein, with the awkward name repressor element 1 silencing transcription factor (you can understand why scientists just call this “REST”), may be controlling these genes in older brains. This discovery was surprising, because while REST was known to be active during early fetal development, it was thought that REST was turned off for the rest of a person’s life. Now, in a new study published in Nature, Yankner has found evidence suggesting that the gene that codes for the REST protein switches on again as our brains age . In this biological “second act,” REST plays a role in the activation of an anti-stress response that protects aging brain cells from destructive molecules called free radicals and toxic misfolded proteins, such as amyloid, that cause them to degenerate and die. In their latest work, Yankner and his colleagues compared the levels of REST in a type of brain cell, called a neuron, in the PFCs of young adults (20–35 years) and healthy elderly adults (73–106 years) without Alzheimer’s disease. They found that REST was present at low levels in the PFC neurons of young adults, but rose steadily with age. Further examination revealed that REST switches off genes that trigger cell death, along with other genes that have been implicated in Alzheimer’s disease. The researchers went on to look at REST activity in the PFC neurons of people with Alzheimer’s disease: some with early and others with late stage disease. It turns out that if a person showed any signs of Alzheimer’s disease, REST was almost absent from the control center—the nucleus—of these brain cells. Somehow, REST was evicted from the nucleus and exiled to the cell’s “dumpsters,” where, along with toxic misfolded proteins, it was destroyed. 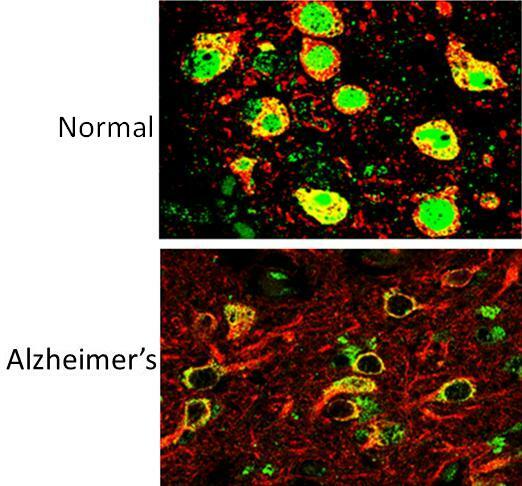 Similar changes were also seen in the PFC neurons of people suffering from other forms of degenerative brain disease, including conditions such as frontotemporal dementia and dementia with Lewy bodies. These findings suggest REST may provide a clue to the puzzle of why some older people whose brains contain what’s long been considered the hallmark of Alzheimer’s disease—amyloid plaques—do not develop the disorder. To investigate this further, Yankner’s team tapped into the wealth of clinical information and tissue carefully gathered by the NIH-funded Religious Orders Study, a prospective, long-term human study begun in 1993. In this study, more than 1,000 older members of various Catholic communities have volunteered to undergo annual assessments of their memory and other cognitive skills while they are alive, and, upon their deaths, to donate their brains to research. Yankner and his colleagues focused on the subset of volunteers who had retained strong memory skills until their deaths, despite having brains that showed classic signs of Alzheimer’s disease. The researchers’ analysis found that these individuals’ neurons contained significantly higher levels of REST than did those of their counterparts who had suffered from dementia. In addition to human studies, Yankner’s team explored the function of REST in various model systems, including worms, mice, and brain cells grown in laboratory dishes. Their work showed that when they lowered the activity of the equivalent of the REST gene in the roundworm Caenorhabditis elegans, the microscopic worms were more sensitive to the damaging effects of free radicals and amyloid protein. When the REST gene was added back in, the worms were protected. Next, the researchers knocked out the REST gene in the brains of mice—a move aimed at mimicking the situation in humans with Alzheimer’s disease. When the REST-deficient mice were young, their neurons appeared to be alive and well. However, as these mice grew older, a significant number of neurons died and degeneration set in. In addition, when the investigators removed neurons from the REST-deficient mice and grew them in a lab dish, the brain cells were far more likely to die when exposed to toxic agents, such as free radicals, than those from normal mice. Encouragingly, when researchers inserted the REST gene back into the deficient neurons, they recovered and became more resistant to toxic agents. There are important implications from this groundbreaking work. First, these lab results suggest that REST may be necessary to keep aging brain cells alive and well. Furthermore, these data suggest that it might be possible to develop ways to restore protective levels of REST, thereby preventing, halting, or maybe even reversing the damage done to neurons in Alzheimer’s disease. Yankner’s team is now beginning to search for molecules that safely boost REST levels in brain cells. Intriguingly, lithium, which is currently used as a treatment for bipolar illness, raised levels of REST and increased its function in brain cells grown in the laboratory. However, it will take considerably more research to figure out whether this could be a safe and effective treatment for Alzheimer’s disease, or whether other drugs that target the REST pathway might be promising. Intriguingly, Yankner’s group happened to detect the very highest levels of REST in the brains of people who lived to an extremely old age, such as centenarians. They’ve also discovered that REST stimulates genes that are known to increase lifespan in animal models. So, as you might imagine, this group of REST researchers won’t be resting anytime soon! In addition to all of their work on Alzheimer’s disease, they are now keen to explore whether this protein might play an even broader role in healthy aging. Gene regulation and DNA damage in the ageing human brain. Lu T, Pan Y, Kao SY, Li C, Kohane I, Chan J, Yankner BA. Nature. 2004 Jun 24;429(6994):883-91. REST and stress resistance in ageing and Alzheimer’s disease. Nature. Epub 2014 Mar 19. Very encouraging work from petri dish to mice to humans.